In their minds, Trump became “unhinged” in his efforts to deny being the racist they portray him as being. Such slanders would incite anyone to counter-attack. Yet in leftist minds, if they protest it indicates guilt, but if they remain silent it also indicates guilt because in a leftist world you are damned if you do and damned if you don’t. The media of today are no longer journalists reporting events. They are activist propagandists striving to create a narrative to shape public opinion. A gem of southern wisdom is found in an old saying, “Opinions are like assholes. Everybody has one and thinks everyone else’s stinks.” The days of journalists reporting events and editorialists giving their opinion of events are gone. Now all news is colored, skewed, mischaracterized, and designed by reporter’s opinions to skew the public’s perception of the facts. Only an education in journalism, that included reviewing how propaganda is created from the blatant to the most subtle, is why this author can recognize the left’s lies. What they did to Reagan they are now doing on steroids the same to Trump. The left creates fictions of all kinds by which to influence those who pay little attention to the news but only follow headlines. Just as the body of every story they wrote had disclaimers about Russian collusion hidden deep within them, their entire purpose is to dupe the unwitty with shallow vision by covering their butts in the most subtle of ways. This is sick, insidious, and evil. This is how the left operates. They slander the righteous with lies to establish a false premise and then act as if they are innocently telling the truth. The pathological liar is always secure in telling his lies because most people are ignorant of the facts. Were FOX News to have done the same thing to Obama, saying he was an agent of Iran spending two years investigating him to come up empty, they would have been excoriated to the heavens and abandoned by morally intelligent people. But if statements were made that Obama is a Moslem who funded ISIS as they were made about Trump being a Russian agent there would be a glaring difference in the two. This is an example of the proof of truth between Trump and Obama. In Obama’s case, there is a mountain of evidence to prove that statement to be true. In Trump’s case, there is only the liberal fiction that they avow to be the reality. That Obama funneled billions of American taxpayer dollars to the Muslim Brotherhood and Iran are known facts, while Mueller didn’t find diddly about Trump having any dealings with Russians because they never happened. They can only create lies and innuendo that the Trumps worked with Russians while they ignore the very real payoffs Hillary got from Russian oligarchs. A lie about Obama would be that he is a Christian American, and that is the lie the left tells and will defend to the death. “Die with the lie” is the motto of the conman. Twitter, along with most social media, has become the cesspool of humanity that brings out the worst in people. Because they can speak anonymously rather than face-to-face it reveals people’s true hearts as well as lends a platform to charlatans, fakes, and pretenders. Many Twitter sh*t storms are actually liberal bots created by hackers to make their rants appear to be the cacophony of thousands. Think liberals are reasonable or intelligent? Read their tweets and find out just how little they know or understand. Leftist Nazi thugs attack anyone anywhere who displays their support for Trump, Christ, or America. This intimidates most people to hide their support for fear of reprisals; liberal fascists stealing their MAGA caps, punching them, keying their cars, or spitting in their food. Trump support is then hidden allowing the left to declare that no one supports Donald Trump. Leftists then try to shape public opinion to influence people at the polls. This technique works with most people, but the morally intelligent person digs a little deeper rather than just accepting what is on the surface. A prime example is that even after President Trump said the terror attack in N.Z. was heinous, they claim he refused to condemn it because they portrayed the attacker as a white supremacist. It has been revealed that the attackers identify themselves as Eco-fascists of the left trying to gin up hatred of the right by making a terror attack against Moslems that the media could use to slander them. New Zealand’s Prime Minister stupidly abased herself to submit to Islam in the wake of this false flag terror attack. This is why you should NEVER agree with liberals unless they come over to your side. It is said that a teacher doesn’t do well telling their students they’re stupid. But this author has found that telling liberals they are dumb dupes will either get their attention or unleash the animal within them to bray at the moon like the dumb apes of Berkeley shouting down conservative speech. Deceivers and their dumb animals don’t want to hear the truth. If a liberal’s ideas were worthwhile, they could debate a conservative. But they can’t, so they make monkey noises instead in attempts to mock and demean the intelligent in the eyes of their apes. This would make them irrelevant, except now they have provisional ballots by which to commit massive voter fraud with which to dupe the people as they attempt to steal back the presidency and reinstitute Obamunism. (This was successfully tested in California where they overturned four district elections Republicans won to cast them out of office.) When Democrats say blacks are turned away from the polls because of racism, that’s a lie. They were turned away because corrupt Democrat pollsters had already illegally cast their votes for them. 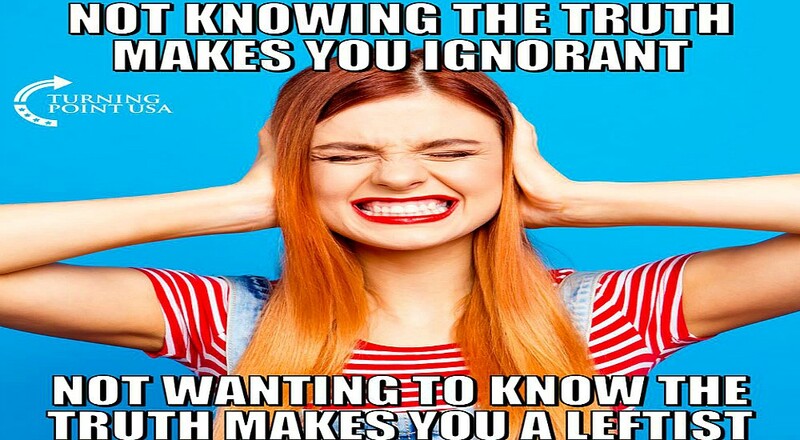 Leftist propaganda has ruled the media and social media to warp the minds of the average person. They demonize Republicans as they conduct witch-hunts against the Trump family and associates. The left criminalizes conservatism while Twitter and Facebook shadow ban righteous free speech. The light of truth must be shined on the left to open people’s eyes to the truth that there is no truth in media. The Left’s Behavior is Guaranteeing President Trump Will Be Re-elected on November 5, 2020!Dictator Donald Trump?